I normally post on the Ontario threads, but figured I'd try here first to see if anybody locally would know what I'm looking for. I've been playing with the idea of a trip to St. Pierre and Miquelon since last night, after discovering the ferry and really liberal travel requirements (to me they kinda remind me of what travel to the States used to be in the 80s and 90s, apparently Canadian citizens only need a government ID card [driver's license for instance] according to the ferry company's page) and what seems to be a relatively low cost and low-hassle experience compared to driving south to the States or flying across the Atlantic. Doing a quick Google search last night, I discovered that SPM uses school buses there, mostly older ex-Quebec buses with MTQ specs on them, operating on French SPM plates, that mainly are Blue Birds and Thomas buses purchased from Girardin and other dealers. I pretty much have that nailed down now, but doing more of a search I've been trying to find anything about public transit on the islands. I know there's tours and stuff, there's probably a shuttle that runs from St. Pierre to the Miquelon airport if my hunch is right, and probably route taxis connecting the villages on the backroads off the main road, but even when I tried searching in French (basically using "st. pierre Miquelon transport en commune" and variations of it) I couldn't find information on it. I know it's a really small island, but I'd imagine that they do at least have something running there in terms of public transit? I'm wondering whether anybody from Newfoundland or Nova Scotia or anywhere for that matter would know more than what Google knows? I would prefer details in terms of what they run, companies, and routes, but since this place isn't really on the radar of the transit community, even just a general summary or local knowledge from even years ago would be helpful. Of course I wouldn't just be looking at buses there, but I'll definitely see everything historical and cultural that needs to be seen as well. Apart from my travels to Abitibi-Temiscamingue in northern Quebec, I've never been out of Ontario (took a trip to Soo Michigan as a toddlerbut I don't remember a thing nor have any photos from it, so it doesn't count for me), so I'd probably include it as part of a stop on a trip to the Maritimes or something. 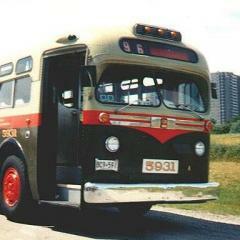 I recall seeing photos quite a few years ago of a right hand side drive MC8 that was used in St. Pierre. I think they still drive on the "wrong" side of the road there. Can anybody confirm that is still the case? 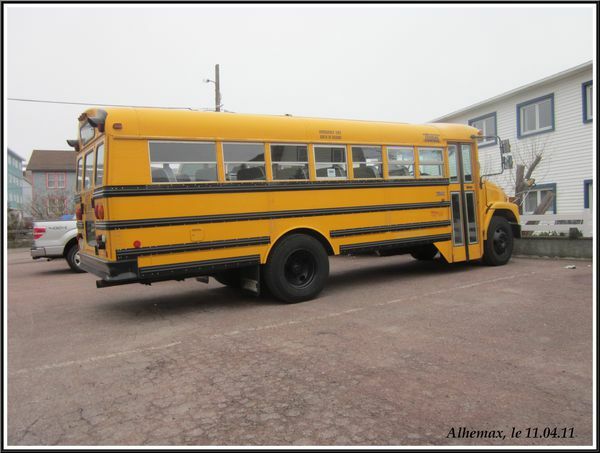 I did a Google Images search and found what appear to be just two ex-Quebec school buses on the French Islands, one a Blue Bird TC/3000 with the license plate SPM 819B, and the other a Thomas FS-65 with a plate I can't quite make out. One thing I noticed in these photos is that apparently there have been no external modifications to these buses, with "ARRET" stop arms even though stop signs in France say "STOP". That's the same Google search I've done last night. I think there might be two TC3000s shown here. There's the plain one in the bottom photo parked next to the FS65, and then SPM 819B is another different, albeit more well-photographed vehicle. It has decals on it as well as Alcoa chrome rims. If you look at the pic of 819B's rear end, I can see what looks like a Saf-T-Liner EF parked next to it. I did my Google search in French, so was able to pull up more, including pics of SPM 819B unloading children in centre of town, with lights activated. 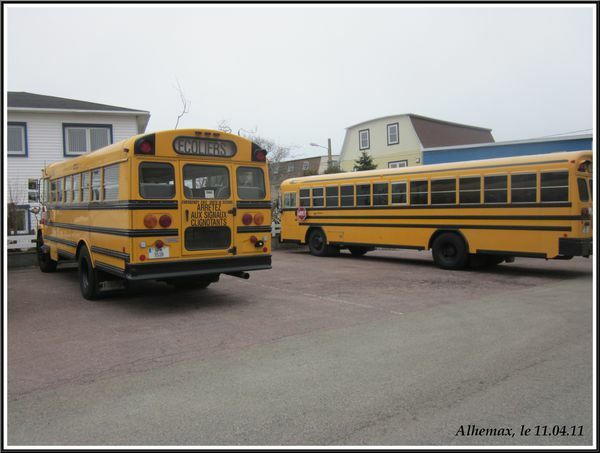 From what I can tell there is no public transportation in St. Pierre and Miquelon aside from taxis and school buses. I know a ro-ro ferry service is slated to start later this year so it will be possible to drive there, though I'm not sure what rules there will be for taking Canadian plated cars onto the island. Since there's no requirement for a passport or visa for Canadian citizens coming in on the ferry, I wouldn't think that SPM is part of Schengen, so there may be relaxed rules for Canadian cars at least in the beginning, and perhaps later on they'll allow American cars on the island too. They already have a lot of American-spec cars on the islands already. Hearing this news is a god-send to me though! Now I have two goals in my life, to be the first Ontario-plated car on the island, and eventually be on a tour bus from my area (basically either Hammond, Angel, ONR, Tisdale or Maheux) on that island on a tour. Even though SPM is part of France, it is not part of the EU, and so the Schengen rules do not apply to visitors. However, AFAIK French motor vehicle regulations still apply, including requiring Green Card insurance and possibly an International Driving Permit. Actually, the plates on SPM cars have the French Euroband with the EU flag on them if you examine the plate of the buses closer, so they could be a part of the EU but not part of Schengen. SPM also uses the Euro, so they're part of the Eurozone. I think only places part of the EU are allowed to use the EU flag on their license plates, so if EPM wasn't in the EU, the plates would look the same as they did in the 90s before the Euroband became standard on French license plates. I visited St. Pierre back in 2005. I'm sure a few things have changed by now. My sister & I flew to St. John's, NL, rented a car and drove to the town of Fortune. We stored our rental car in a gated compound and rode a fastcat ferry to St. Pierre. On board the ferry, a rep from the local tourism office was handed out guidebooks and acted as a travel counsellor. Upon arrival, we went through French customs. There were sniffer dogs checking out our baggage. People showed their provincial driver's license. I brought my passport as I wanted it stamped with SPM. From what I recall, the ATMs dispensed Euros. There's no public transit as the entire town is walkable. I spotted an MCI that was used as a tour bus. Being Asian, we were the centre of attention in SPM. People were nodding at us on the streets and saying bonjour madame & monsieur. The locals were also surprised that were able to speak a few words of French, especially when ordering food at a restaurant or shopping in a convenience store. We never made it to Miquelon, but we took a boat tour over to Iles aux Marins (Sailors Island). The issues I was thinking of are mainly having to buy extra insurance or post a customs bond (you need this to drive to Mexico for instance). SPM is a separate customs area from Metropolitan France though, so it might not be an issue. I read a really old website while searching around Google about some Swiss who drove around the world in an 80s Toyota Landcruiser I believe with Zurich plates, and one of their stops was in St. Pierre. They did have to buy carte verte to drive on the island, and back then they were able to drive there because they loaded their car on a freighter from Fortune, then took the passenger ferry while their truck was on the freighter. I have a feeling some sort of changes will happen now once this new ferry gets going, simply because if the current system is really cumbersome and bureaucratic, they'll probably be overwhelmed in the first year of the car ferry simply because there'll be too many cars, both SPM and Canadian, that will want to try this if it gets popular, and if the bureaucracy creates like a 3 hour lineup at the port because the entire ferry is trying to fill out paperwork, something will have to change. Like maybe streamline the process or something like that. Compared to having one or two foreign cars coming every year or two years mixed in with some SPM or Newfoundland-registered trailers hauling imports back when the Swiss did it, they'll probably have between 3 transports to 13 cars a day or multiple times a day depending on how popular the ferry gets. I also read that the plan is that with the new ro-ro fast-cats that were mentioned on here, there's plans for one to go to Newfoundland from St. Pierre and another one from St. Pierre to Langlade-Grand-Miquelon. So next year it'll probably be possible to drive the whole territory in your car or for bus tours to explore the place.